he vineyards of the Jura in particular and Savoie produce some of the most strikingly original wines in France. They are steeped in tradition and relatively unknown outside of their homeland but some fine and very diverse styles are produced. The Jura is more marked by rolling hills than high mountains. The Savoie by contrast offers a magnificent backdrop with the Alps in the background. With the proximity of the ski fields and their thirsty winter tourists, much of what Savoie produces is disappointingly light and dilute. As in all regions though there are instances of really characterful wines being made. To enjoy the best both regions have to offer you are likely to have to visit in person. Located to the west of Burgundy’s Côte d’Or, the vineyard area is situated at altitude on the western slopes of the Jura mountains. There are a number of appellations here. The Côtes du Jura AC encompasses the whole region and produces red, rosé and white wine. Reds and rosés are produced from the local Poulsard and Trousseau as well as Pinot Noir. Those produced from Pinot and the sturdy and structured Trousseau are the best bets. Among the whites, Chardonnay is good and can be very elegant and structured with great fruit purity. Equally interesting are the nutty, characterful Savagninbased wines. Some oak is used but it tends to be subtle and restrained. The speciality of the region is vin jaune. This is not dissimilar to fino sherry in character as it is aged under a yeast film, yet it remains unfortified. Many regular Savagnin wines are also produced in a similar style but generally spend less time under the flor yeast. Vin Jaune is remarkably ageworthy. There are also three smaller ACs. Arbois produces good red and white (from the same varieties as in the Côte du Jura), Vin de Paille and sparkling wines are also produced. At L’Étoile dry whites from Chardonnay and Savagnin and some moderate sparkling wine are produced as well as vin jaune. 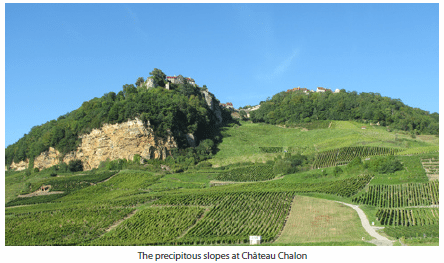 The spectacularly sited vineyards of Château Chalon are solely for the production of vin jaune. Another speciality found throughout the region is the rare vin de paille. It is, like examples in the northern Rhône, a late-harvested sweet white with a hint of nutty oxidation. Both whote and red varieties are used and some examples can be very sweet indeed. Most sparkling wine is made by the traditional method and is labelled as Crémant de Jura. There is the odd decent example. Most growers also offer Macvin du Jura, a vin de liqueur which has marc added to fermenting grape juice. There are some characterfully nutty examples, which are quite unique in style. This high alpine vineyard area is located to the south-west of Geneva and covers a large area. The backdrop of the Alps provdes for some of the most spectularly sited vineyards in France. The regional AC is Vin de Savoie. There are some good whites from the Altesse and Bergeron (Roussanne) grapes, which are fresh and floral and reds mainly from Pinot Noir and Mondeuse. The latter particularly are worth considering. The wines at best are sturdy, structured and very characterful. Altesse is also known as Roussette and has its own AC, Roussette de Savoie. Good light, fresh, dry whites from Altesse and sparkling wines from Molette (with some Altesse) are produced under the Seyssel AC. The Chasselas-based whites at Crepy AC are generally unexciting.